Check out this link. 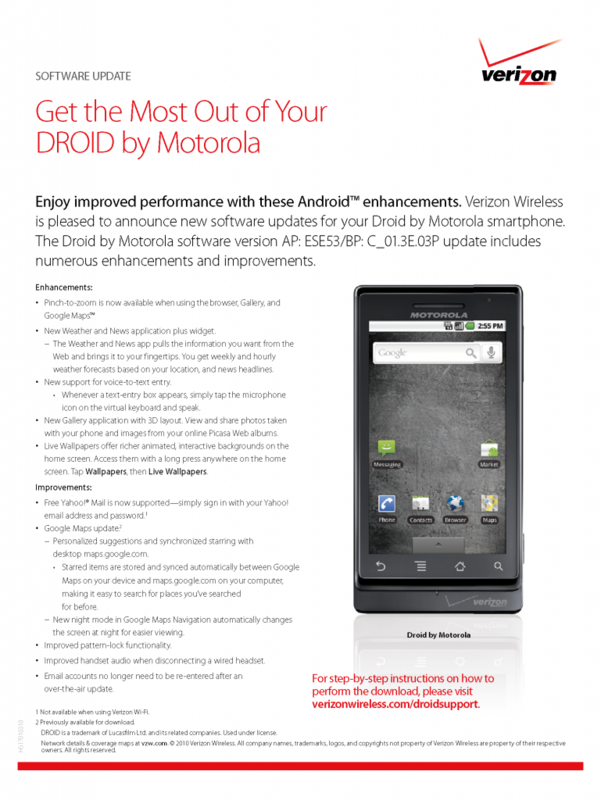 That would be the direct link to the Verizon PDF showing the Android 2.1 update details which we can now assume will drop at any day. You’ll notice something incredibly familiar on that document which relates to the build. Yep that’s right, “ESE53”. The same build that was leaked to dev’s a few weeks ago which we also flashed onto our phone to test. This was the one which included live wallpapers, just 3 screens, no 3D launcher and is featured on every single major custom ROM at this point. To confirm that the official date is finally upon us, you can get to that PDF by visiting the official Droid support page at Verizon’s site. I just spoke to a Verizon Rep and She Said the “approval Date” for the Software was today….and that the software will be rolled out in Stages beginning Thursday March 18, 2010 at 12:00pm EST in Stages…. Yes official….March 18th first roll outs. So if you are running a custom ROM, you may want to wait a while before reverting back to stock. And to those of you who haven’t rooted just yet, it looks like there won’t be any surprises. Oh and we should also point out that Flash is not included anywhere on the document. Sad. Tuesday Poll: Favorite Home Replacement App?